Kupferstich- Karte, b. A. Zatta, "Il Canadá le Colonie Inglesi con la Luigianan e Florida di nuova Projezione". Notizie spettanti all'antichissima scola de' pescatori in oggi denominata Casa Matha. UNITO A: Statuti e rubriche dell'ordine della casa Matha del 1304, 1305, 1306, 1307, 1308. Matricole contenenti i nomi delle persone ascritte nell'ordine della casa Matha cominciando dall'anno 1305 descritti nel codice in pergamena, ed esposti con ordine e possibile chiarezza, e diligenza. Ravenna, Tipografia di A. Roveri e figli, 1839, due volumi in-4to cartonato coevo (con piccole abrasioni e strappi ai dorsi) pp. (10)-294-(2) + pp. 230-(4). con fregio tipografico al frontespizio e un bel ritratto inciso all'acquaforte da Gaspare Ginanni dal disegno di F. Nistri posto in antiporta (le pagine 289/294 e l'ultima carta con l'imprimatur sono state rilegate erroneamente all'epoca dopo la pagina 224) Prima ed unica edizione. Il primo volume è suddiviso quattro parti: nella prima si dimostra come l'epoca della sua istituzione sia piu' antica di quanto si ritiene; la seconda tratta dei ricchi stabilimenti posseduti dalla corporazione dal 1034 sino al 1778, nella terza gli Statuti e le leggi dell'antico ordine, nella quarta commenti, notizie ed atti desunti da un antico codice in pergamena. Nel secondo volume vi sono la riforma degli antichi statuti, e il catalogo degli individui che nel 1345 formavano il corpo dei confratelli. Catalogue de tableaux et dessins originaux des plus grands maîtres des différentes écoles ; morceaux à gouasse, terres cuites, pierres gravées & pâtes de composition, &c. qui composaient le Cabinet de feu Charles Natoire, ancien professeur et directeur de l'Académie de France à Rome. LXXIV, 356 S., mit gest. Frontispiz von Meyer, Diagramm im Text u. 6 (2 teilkolor.) Kupfertaf. 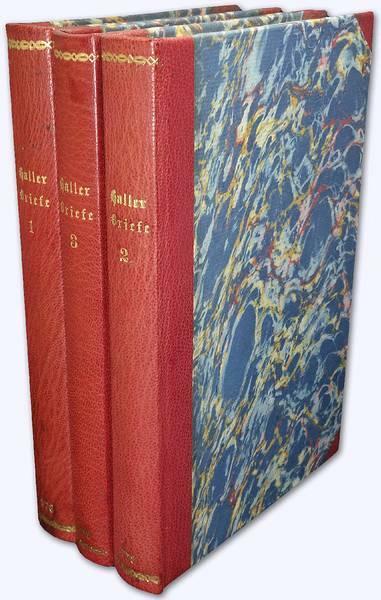 von F. Guimpel (diese am Ende eingebunden) / XVI, 296 S., 8, Neueres Leder mit Rückentext u. goldgepr. Fileten Slg. du Prel 733 Ackermann II/283: "Vergriffene und sehr gesuchte Ausgabe [...] Ausführliche Besprechung des Werkes im Archiv für den thierischen Magnetismus. Bd.I,3 von Nees v. Esenbeck." - Von dem Arzt Karl Christian Wolfart (1778-1832) aus den Manuskripten Mesmers hrsg. u. mit dem zugehörigem Kommentarband. 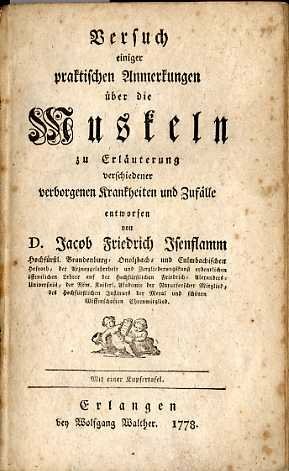 Dieses letzte zu Mesmers Lebzeiten (1734-1815) veröffentlichte Werk dokumentiert sein Denkgebäude sowie praktische Hinweise zur Heilung. Franz Anton Mesmer machte sich durch seine Magnettherapie einen Namen, die nach seiner Meinung nicht auf der Wirkung des Magneten, sondern auf einem dem menschlichen Körper ausströmenden "Fluidum" beruhte, das durch aufgeladene Gegenstände noch verstärkt werden konnte. Die Entdeckung gilt heute als Ursprung der Hypnosetherapie. - Breitrandiges u. unbeschnittenes Expl. Frontispiz mit sauber ergänztem Eckabriss (kein Text- oder Bildverlust) fast durchgehend leicht braunfleckig wenige Blatt mit schwachem Feuchtigkeitsrand u. nicht aufgeschnitten, sonst ein gutes Expl. Parny (Évariste Désiré de Forges) de. May 5, 1778. A document signed <I>"Thos. Wharton, Pres"</I> as the President of the Supreme Executive Council of Pennsylvania. 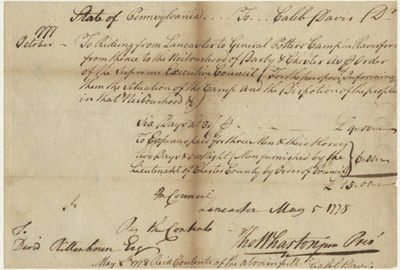 The document ordered David Rittenhouse, a noted patriot, to pay <I>"Caleb Davis... [for] Riding from Lancaster to General Potters Camp in Haverford from thence to the neighborhood of Darby and Chester as per order of the Supreme Executive Council for the purpose of informing them the situation of the camp and the disposition of the people in that neighborhood... "</I> David Rittenhouse was on of the foremost scientists and mathematicians in colonial America. During the Revolution, he served as Pennsylvania's treasurer. The document contains some toning on the folds and is professionally silked for reinforcement purposes. The document is in very good condition with a large, dark signature. Voyage dans l'hémisphère austral, et autour du monde, fait sur les vaisseaux de Roi, l'Aventure & la Résolution, en 1772, 1773, 1774 & 1775. Dans lequel on a inséré la relation du Capitaine Furneaux, & celle de MM. Forster. A DISSERTATION ON THE LANGUAGES, LITERATURE AND MANNERS OF EASTERN NATIONS. Oxford, Clarendon Press, 1778. Originally prefixed to a Dictionary, Persian, Arabic, and English. The 2nd edition, to which is added Part II. Containing additional observations. Together with further remarks on A New Analysis of Ancient Mythology: in answer to An Apology, addressed to the author, by Jacob Bryant, Esq. 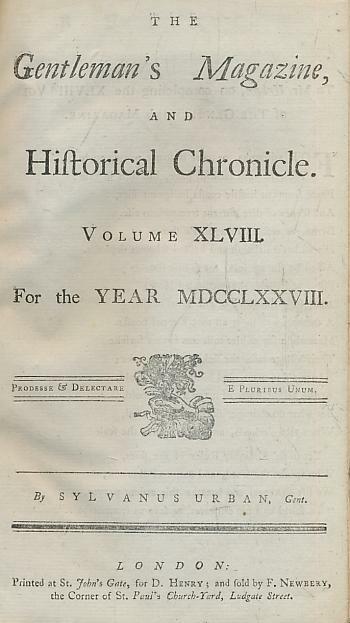 SECOND EDITION, greatly enlarged, 1778. 8vo, approximately 210 x 130 mm, 8¼ x 5 inches, pages: xii, 288, (2), 289-490, divisional title to Part II follows page 288 at the end of Part I, full contemporary tree calf, gilt patterned border to covers, gilt patterned decoration in panels separated by gilt bands to spine, 1 panel in dark green, red morocco title label, marbled endpapers. Small scratch, small grazed area and small dent to top edge on upper cover, part of fore-edge worn on lower cover with loss of gilt, 1 lower corner showing cardboard at tip, spine gilt slightly dull, unusual bookplate on front pastedown, plain with a large decorative "G" and a crown just above it, small private library number label in the upper corner, small light stain to fore-edge margin of first 30 pages, title page and first 4 Contents leaves strengthened neatly at fore-edge with archival tape, similar very pale staining to fore-edge margin recurs intermittently from page 177 to the end, otherwise contents clean, binding tight and firm. A very good copy of a scarce book. Sir John Richardson (1740/41-1795), was a lawyer and orientalist and his Dictionary, the first in Persian, Arabic and English, was published in two volumes in 1777 and 1780. 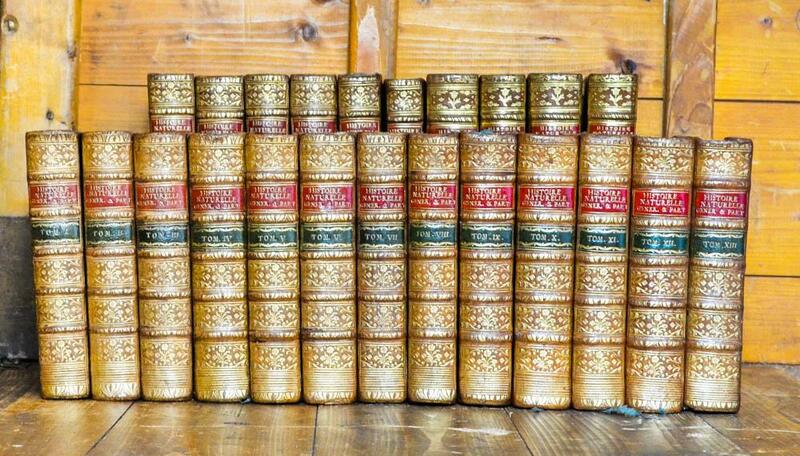 Part I of our book preceded the dictionary in Volume I, and was also published separately in 1777. The ODNB describes it as "a long, intellectually ambitious and highly polemical (work). Those who tried to write the history of Eastern peoples without using Eastern sources were particular objects of his disdain. One of those thus attacked, Jacob Bryant, retaliated in An Apology to Richardson, to which Richardson replied in a second edition of his 'Dissertation". Part II which is only in the second edition and enlarges the work by some 200 pages. MORE IMAGES ATTACHED TO THIS LISTING, ALL ZOOMABLE. FURTHER IMAGES ON REQUEST. POSTAGE AT COST. Printed for Edward and Charles Dilly, London, 1778. Very good: boards rubbed; scattered foxing. 8 3/8 x 5 1/4 inches, , 315 (i.e. 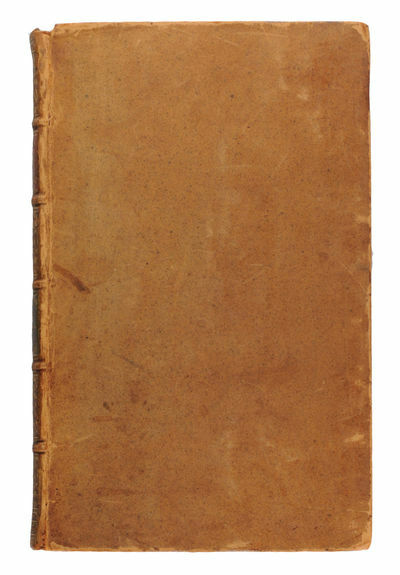 215),  pages, modern boards with vellum spine, Includes half-title, often lacking. With folding plan of Mexico City. First edition in English of "[a] thrilling account of a race against time to reach Lower California before the transit of Venus occurred." (Streeter, ref. 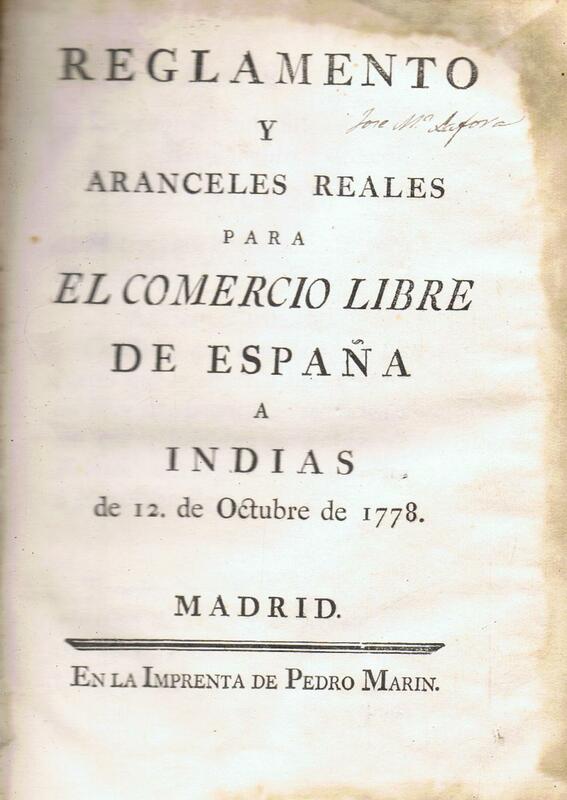 1772 Paris ed.). To this edition is added an account of a voyage to Newfoundland as well as a description of the town of Salle, Morocco. Sabin 12004. 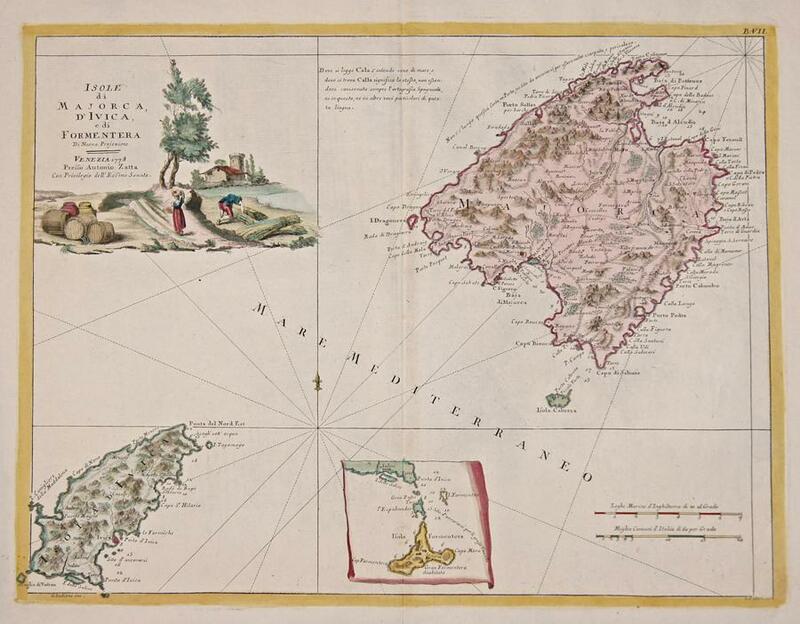 Artist: Zatta Antonio d ; issued in: Venice; date: d1778 - - technic: Copper print; - colorit: original colored; - condition: Perfect condition; - size (in cm): 32 x 41,5; - description: Map depicts the biggest Balearic island Mallorca. Also showing Ibiza and on an inset maps Formentera which is together with some other smal islands the group of Pityusic Islands. ; - vita of the artist: Antonio Zatta (1757 ? 1797) was an Italian cartographer who was based in Venice. One of his major contributions include the Atlante Novissimo, a four volume atlas of the world in very high scientific quality. Basel: Chretrien de Mechel Graveur, 1778. First Edition. Hardcover. Very Good Condition. Wide format folio in later but early half leather over marbled boards, worn at corners, hinges rubbed, edges gilt. Modest foxing, occasional finger soiling and wear to plate edges, very good overall. 30 plates - 4 preliminary plates and 26 showing the museum contents, room by room. A groundbreaking work of museum cataloging - a smaller edition more useful as a gallery guide was produced as few years later. Size: Folio. Quantity Available: 1. Shipped Weight: 1-2 kilos. Category: Art & Design; Inventory No: 046586. London: Strahan and Cadell, 1778. The scarce second edition (first published in 1776) and the only other edition to be published in quarto format. Two quarto volumes (280 x 215 mm, text being 200*130 and uncut 300*230, so a real large-paper copy). , 510; , 589, [1=blank] pp. Without half-title in Volume II (no copies known with half-title in Volume I). Early 20th-century dark blue halfcloth with marbled boards. Top edge stained red. Some page edges browned, occasional spotting, severe on quire 3M of Volume I and 2N of Volume II, discrete repair to blank area of p 115 of Volume II. PROVENANCE: Municipal Museum Warrington, its bookplate at fpep and some small stamps. Some old handwriting in pencil. Minor edgewear. 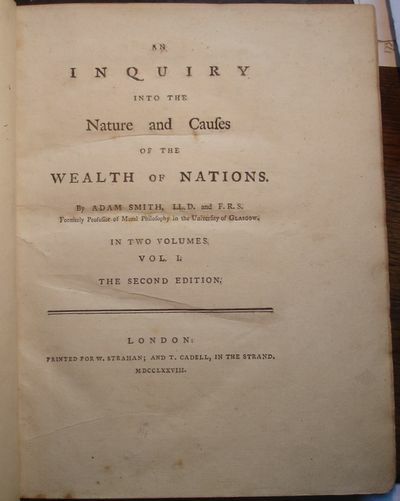 Adam Smith (1723-1790) spent ten years in the writing and perfecting of The Wealth of Nations. "The book succeeded at once, and the first edition was exhausted in six months. Whether it be true or not, as Buckle said, that the Wealth of Nations was, in its ultimate results, probably the most important that had ever been written it is probable that no book can be mentioned which so rapidly became an authority both with statesmen and philosophers" (D.N.B.). "The history of economic theory up to the end of the nineteenth century consists of two parts: the mercantilist phase which was based not so much on a doctrine as on a system of practice which grew out of social conditions; and the second phase which saw the development of the theory that the individual had the right to be unimpeded in the exercise of economic activity. While it cannot be said that Smith invented the latter theory his work is the first major expression of it. He begins with the thought that labour is the source from which a nation derives what is necessary to it. The improvement of the division of labour is the measure of productivity and in it lies the human propensity to barter and exchange Labour represents the three essential elements wages, profit and rent and these three also constitute income. From the working of the economy, Smith passes to its matter stock which compasses all that man owns either for his own consumption or for the return which it brings him. The Wealth of Nations ends with a history of economic development, a definitive onslaught on the mercantile system, and some prophetic speculations on the limits of economic control The Wealth of Nations is not a system, but as a provisional analysis it is complete convincing. The certainty of its criticism and its grasp of human nature have made it the first and greatest classic of modern economic thought" (Printing and the Mind of Man 221, describing the 1776 first edition). The second edition is the rarest of the early editions of The Wealth of Nations. Only 500 copies were printed. The third edition consisted of 1,000 copies and the fourth 1,250 copies. 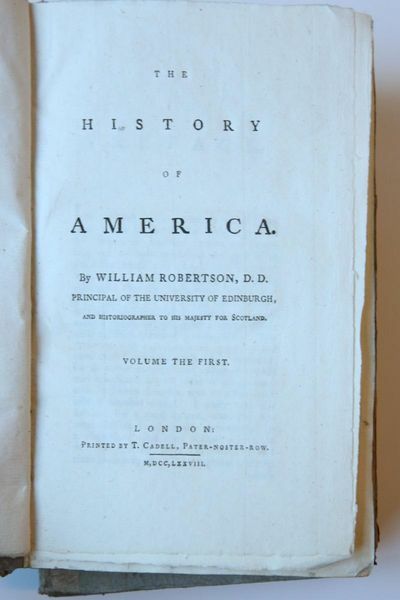 It is unknown how many copies of the more common first edition were published. "The second edition exhibits a number of alterations large and small, some providing new information, some correcting matters of fact, some perfecting the idiom, and large number now documenting references in footnotes" (William B. Todd, in the 1976 Oxford edition of The Wealth of Nations). Kress B.154. Goldsmiths 11663. Sabin 82303. Grolier, 100 English, 57 (describing the 1776 first edition)..
Bern, bey der Typographische Gesellschaft, 1778. - XV, 234 S., mit Schmuckvignette / 4 Bll., 258 S., mit Schmuckvignette / 4 Bll., 189 S.; alle mit gest. Titelillus., 8°, Neueres marmoriertes Halbleder mit goldgepr. Rückentext (3 Bde.) Ein Werk, das sich überwiegend gegen die materialistische Bibel- u. Religionskritik von Voltaire wendet. - "Was in den Evangelien am härtesten die Feinde der Offenbarung drückte, die Wunderthaten Jesu, wurden von den Juden zu allen Zeiten, wurden von Celsus und Julianus als wahre Geschichte angenommen." (Bd.I, S.133) - "Die Zauberey: eine schwer aufzuklärende Materie, weil der körperliche Einfluß der Macht böser Geister zu unseren Zeiten nicht mehr sichtbar ist, und wenigstens durch keine Begebenheit erwiesen wird; denen ich Glauben zustellen könnte. Aber daß niemals Zaubereyen gewesen seyen, wird durch das verneinende Beyspiel unserer Zeiten nicht bewiesen." (Bd.III, S.83) - Der Universalgelehrte Albrecht von Haller (1708-1777) war ein Schweizer Mediziner, der auch als Dichter u. Literaturkritiker der Aufklärungsepoche hervor trat. - Textblöcke breitrandig u. unbeschnitten, dadurch angerändert; tlw. mit kl. Randläsuren, sonst schöne Bände. 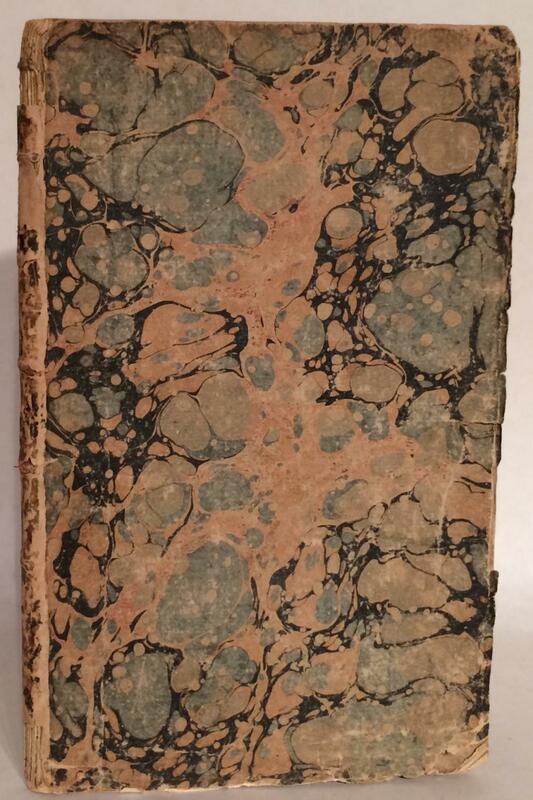 London, G. Robinson, 1778.. 6. The Human species. FIRST EDITION 1778, 4to, approximately 280 x 220 mm, 11 x 8½ inches, FOLDING CHART (MAP) Representing the Isles of the South Seas and a folding Table which compares the various languages of the isles of the South Sea and of various nations to the east and west of it, plus a table in the text, pages: , iv, (2) - subscribers, iv, 9-16 - Journal, -649,  - errata, (the Journal is a brief month by month account of the voyage of the Resolution from July 1772 to July 1775). The collation is correct and all text etc is complete. Bound in full calf, rebacked, gilt lettered maroon label, extra gilt decoration to spine. Covers rubbed and corners slightly worn, slight shelf wear to edges, a couple of small scrapes to upper cover, endpapers signed by 2 members of the Hutchinson family, very small hole to inner margin of title page, neatly repaired, small piece torn from top inner margin of leaf of Subscribers and last leaf, no loss of printed area, the pages 9-16 ( A Journal) in the front of the book are slightly shorter than the other pages (these pages are not found in all copies), 2 tiny ink spots in blank area of page 115, folding table at page 512 slightly foxed in the margins with offset onto margins of adjacent text pages, otherwise contents clean. A very good copy. "Johann Reinhold Forster (1729-1798) originally from Germany, was a scientific writer and translator who accompanied Cook as naturalist on his second Pacific voyage. An account is given of the countries visited in 1772-75, but for the most part this work concerns the South Sea Islands. The observations concerning the "human species" are especially interesting and give detailed information on the natives... populations, food, cannibalism, the status of women, customs, languages, and mythology. The last section presents a detailed evaluation of steps taken for the preservation of health of Mariners on long voyages, ... Forster deals at considerable length with the health and diseases of the South Sea islanders. He discusses venereal disease on several pages and suggests it was endemic in the Islands..." Hill, Collection of Pacific Voyages, Volume I, page 109; Bibliography of Captian James Cook, The Library of New South Wales, No. 1262; Sir M. Holmes, Captain James Cook , A Bibliographical Excursion, page 39, No.29; Cox, Travel, Volume I, page 61; Joseph Sabin, A Dictionary of Books relating to America, 25140; Sotheby's Exploration and Discovery, The Library of Franklin Brooke-Hitchin, Part I page 149, No. 298. MORE IMAGES ATTACHED TO THIS LISTING, ALL ZOOMABLE. POSTAGE AT COST. London, Cadell, 1778. 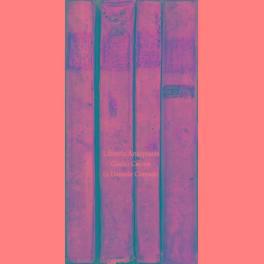 3 volumes [book I-VIII]. Original boards, 4°. 272+387+363+(19) pag. Illustrated with a folding plate in vol I. B0247. Vollständige Mühlen Baukunst, darinnen werden I. Alle Grundregeln so zu der Praxi nöthig, die doch gar wenigen recht bekannt sind, treulich angewiesen. II. Die Vortheile, die man bey Anlegung der Wasserräder alle Sorten von Maschinen zutreiben, in acht nehmen muß, Auf den höchsten Grad der Vollkommenheit gebracht. III. Was insonderheit an Korn-, Graupen-, Papier-, Oehl-, Pulver-, Säg-, Steinschneide-, Bohr-, Schleiff-, Sensen-, Kessel-, Eisendrat-, Hächsel- und Dreschmühlen zu verbessern aufrichtig entdecket. 4. Auflage. London: Printed by James Phillips, 1778. Small 4to. , 38, pp. Expertly bound to style in half period russia and marbled paper covered boards, spine with raised bands, black morocco lettering pieceFirst editionAfter service as a surgeon's mate in the Royal Navy, Dr. Hulme became the first physician at the General Dispensary for the Relief of the Poor and subsequently became physician to the City of London Lying-in Hospital. In 1774 he was appointed physician to the London Charterhouse and was elected fellow of the Royal Society in 1794. In the present work, Hulme advocates for the multiple benefits, including the cure of scurvy at sea, of salt of tartar (potassium carbonate) together with a weak spirit of Vitriol.ESTC T47015. London, G. Robinson, 1778. 6. The Human species. FIRST EDITION 1778, 4to, approximately 280 x 220 mm, 11 x 8½ inches, FOLDING CHART (MAP) Representing the Isles of the South Seas and a folding Table which compares the various languages of the isles of the South Sea and of various nations to the east and west of it, plus a table in the text, pages: , iv, (2) - subscribers, iv, 9-16 - Journal, -649,  - errata, (the Journal is a brief month by month account of the voyage of the Resolution from July 1772 to July 1775). The collation is correct and all text etc is complete. Bound in full calf, rebacked, gilt lettered maroon label, extra gilt decoration to spine. Covers rubbed and corners slightly worn, slight shelf wear to edges, a couple of small scrapes to upper cover, endpapers signed by 2 members of the Hutchinson family, very small hole to inner margin of title page, neatly repaired, small piece torn from top inner margin of leaf of Subscribers and last leaf, no loss of printed area, the pages 9-16 ( A Journal) in the front of the book are slightly shorter than the other pages (these pages are not found in all copies), 2 tiny ink spots in blank area of page 115, folding table at page 512 slightly foxed in the margins with offset onto margins of adjacent text pages, otherwise contents clean. A very good copy. "Johann Reinhold Forster (1729-1798) originally from Germany, was a scientific writer and translator who accompanied Cook as naturalist on his second Pacific voyage. An account is given of the countries visited in 1772-75, but for the most part this work concerns the South Sea Islands. The observations concerning the "human species" are especially interesting and give detailed information on the natives... populations, food, cannibalism, the status of women, customs, languages, and mythology. The last section presents a detailed evaluation of steps taken for the preservation of health of Mariners on long voyages, ... Forster deals at considerable length with the health and diseases of the South Sea islanders. He discusses venereal disease on several pages and suggests it was endemic in the Islands..." Hill, Collection of Pacific Voyages, Volume I, page 109; Bibliography of Captian James Cook, The Library of New South Wales, No. 1262; Sir M. Holmes, Captain James Cook , A Bibliographical Excursion, page 39, No.29; Cox, Travel, Volume I, page 61; Joseph Sabin, A Dictionary of Books relating to America, 25140; Sotheby's Exploration and Discovery, The Library of Franklin Brooke-Hitchin, Part I page 149, No. 298. MORE IMAGES ATTACHED TO THIS LISTING, ALL ZOOMABLE. POSTAGE AT COST. Paris, Philippe-Denys Pierres, 1778.. avec un Discours sur les principes des finances; fait pour l'Academie Imperiale & Royale de Schemnitz, par CHRISTOPHE-FRANCOIS DELIUS, Conseiller-Commissaire de la Cour de Sa Majeste Imperiale, Royale, Apostolique & Romaine, a sa Chambre des Monnoies & Mines. 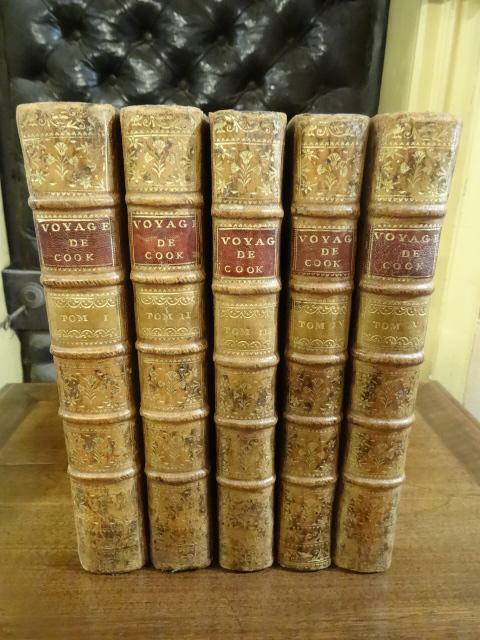 FIRST FRENCH EDITION 1778, 2 volumes, complete set, translated into French by M. Schreiber. 4to, approximately 260 x 190 mm, 10 x 7½ inches, printer's device on title pages, large pictorial headpiece to each volume, 25 large folding plates engraved by Boutrois, I-XI in Volume I, XII-XXV in Volume 2, complete, with descriptions of all the plates at the end of Volume II, pages: , xxii, , 518, ; , 454, , complete with half-titles, bound in old speckled paper boards rebacked in modern calf, raised bands, blind rules, contrasting red and green gilt lettered morocco labels, original endpapers retained. Boards a little marked, scratched and slightly stained, corners just slightly worn, endpapers spotted and dusty, very occasional light foxing, small damp stain to upper outer corner in Volume I showing intermittently from page 143 to the end, not affecting plates, margins of plates lightly foxed. Bindings tight and firm. A very good set of the French edition. 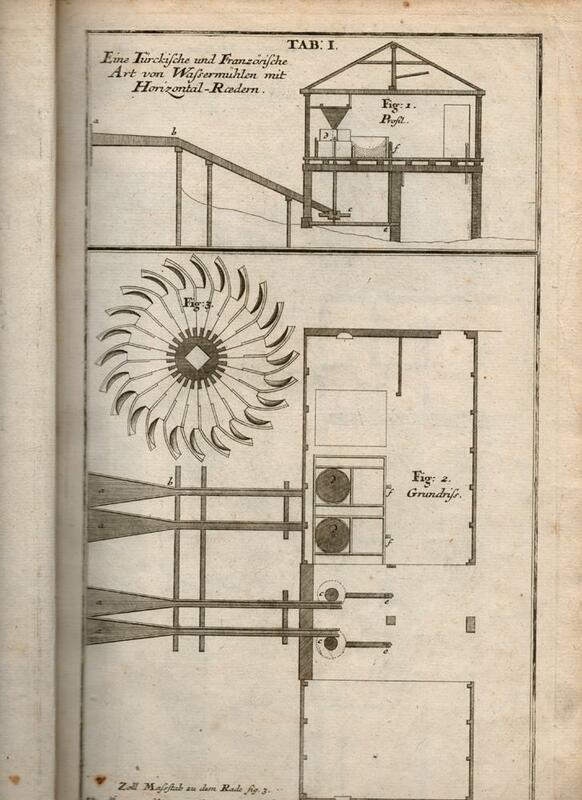 This is a translation of the German work Anleitung zu der Bergbaukunst first published in Vienna in 1773. Delius (1728-1779) was a German metallurgist and mineralogist born in Saxony who held posts in Vienna in the Mining Department, was appointed inspector of mines in Hungary in 1761 and was also Professor of Mining Engineering and Finance in the famous Mining Academy in Banska Stiavnica (Schemnitz) in the then Kingdom of Hungary. He discovered a new process for the extraction of copper and located a precious opal mine in Hungary. He wrote treatises on the origin of mountains and ore veins, and on the Hungarian opals as well as this work on the science of mine engineering. The folding plates show mining equipment and tools including a first aid kit for assisting drowned or asphyxiated miners, mining structures, buildings and machinery, cross-sections of mines and mineral deposits. See: John Sinkankas, Gemology, An Annotated Bibliography, Volume I, page 262, No. 1630; Sotheby's, New York, Scientific Library of Joseph Freilich, page 135, No.153; Catalogue of the Goldsmiths' Library of Economic Literature, Volume 1, page 572, No. 11673. MORE IMAGES ATTACHED TO THIS LISTING, ALL ZOOMABLE. FURTHER IMAGES ON REQUEST. POSTAGE AT COST. May 1778. Endorsement signature <I>"Olivr Wolcott Aud[itor]"</I> signed vertically over the face of a most curious Autograph Letter Signed by Justice of the Peace, John Hempsted, one page, oblong quarto (9" x 7.5"), [New London, Connecticut], May 1778. 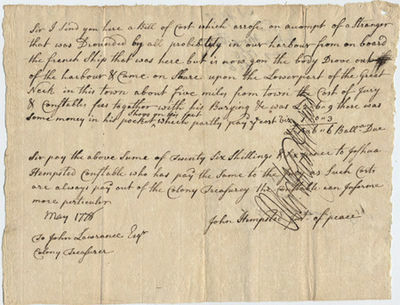 Part letter and part invoice, Hempsted reports to state treasurer, John Lawrance at Hartford on the case of an anonymous Frenchman found dead at low tide in New London harbor. Hemptead, besides being a justice of the peace, was also a captain in the 3rd Connecticut State Regiment. He is perhaps best known for his narrative description of Benedict Arnold's 1781 raid on New London. Hempsted writes: <I>"Sir I send you here a Bill of Cost which arose on account of a Stranger that was Drounded [sic] by all probability in our harbour from on board the french Ship that was here but is now gon[e] the body Drove out of the harbour & Came on Shore upon the Lower part of the Great neck in this town about five miles from town the Cost of Jury & Constables fees together with his Burying & was Â£2..6..9 there was some money in his pocket shoes on his feet which partly payd ye cost viz 1..0..3..."</I> Wolcott adds his endorsing signature vertically over Hempsted's letter. The document is accompanied by an additional manuscript Document, one page, 7" x 3", [no place, no date but contemporary with the above document], a <I>"Coppy [sic] of an Inventory of Sundrys taken from a Dead body of a man supposed to be a French man by a Book in his pocket Viz. one piece of Silver money a Crown peace [sic] @ Â£0-6-8 one Doller [sic] bill & one 1/2 of a Doller Continentel [sic] -- 0-8-0 one 5 d one 2 Connecticut Bills - 0-0-7 one p[ai]r Shoos [sic] taken of his feet ---- 0-5-0"</I> Little is known about this mysterious "French Ship". It was not part of D'Estaing's fleet that didn't arrive at the Delaware Capes from Tulon until July 2, 1778. The ship may have been a merchant ship delivering military stores from France. Light creases, folds a tad ragged, else fine condition, very bright and clean overall. Oliver Wolcott (1726-1797) Signer of the Declaration of Independence from Connecticut, later served as Governor of Connecticut. Astronomie. - Newton, Isaac. - Ferguson, James. Astronomy explained upon Sir Isaac Newton's principles, And made east to those who have not studied mathematics. To which are added, a plain method of finding the distances of all the planets from the Sun, by the transit of Venus over the Sun's disc, in the year 1761- An account of Mr. Horrox's oberservation of the transit of Venus in the year 1639: and, of the distances of all the planets from the Sun, as deducted from observations of the transit in the year 1761. Sixth edition, corrected. London, Strahan, Rinvington and Son u.a., 1778. - 8vo (ca. 21,5x12,5 cm), 3 Blätter, 501 Seiten, 7 Blätter, mit 18 Faltkupfertafeln. Ganzledereinband der Zeit mit roten Lederrückenschild und reicher Rückengoldprägung. Poggendorff I, 734. Houzeau-Lancaster 5260. Wallis, Newton, 75.007. Roller-Goodman I, 391. Umfangreiches, erstmals 1756 erschienenes Handbuch, das zahlreiche Auflagen bis ins 19. Jahrhundert erlebte. 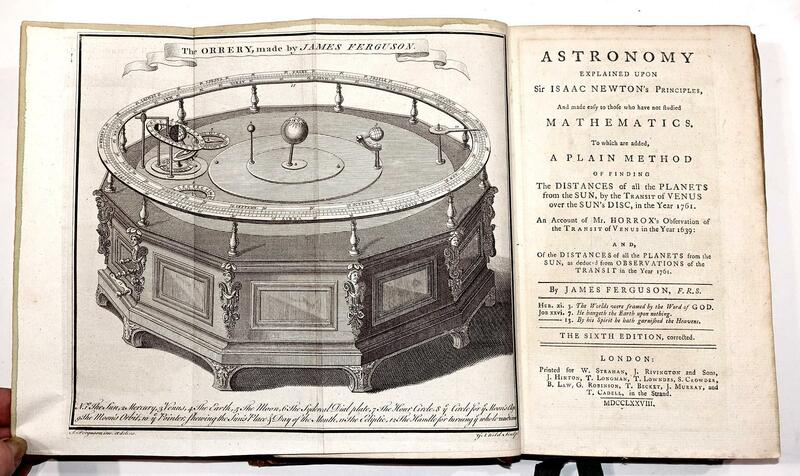 "Ferguson, an original scientist of considerable talent, here makes one of the earliest and most successful attemps to explain Newtonian ideas in popular terms" (Babson 58 Anm.). Die großartigen Tafeln zeigen die neuesten astronomischen Instrumente wie Armillarsphären, Kompasse, Globen, Hemisphären, Darstellungen der Planetenbahnen und der Sonnenumläufe. Eine große Faltkarte (21 x 39 cm) mit einer Weltkarte in zwei Globenansichten: "A Map of the Earth Upon which are marked the Hours and Minutes of the Time". Gelegentlich etwas gebräunt und fleckig, wenige Einrisse und Läsuren in den Tafeln und im Text, Tafeln teils in den Rändern etwas knickspurig, sonst meist ordentlich und wohlerhalten. Aus der Bibliothek von Richard Harington mit dessen gestochenem Wappenexlibris auf dem vorderen Innendeckel Vorderdeckel lose, der Einband sonst etwas berieben, wenige Kupfertafeln mit leichteren Randläsuren und Randbräungen, gestochenes Exlibris (Rich. Harrington) auf dem losen vorderen Innendeckel. Geschichte des Rheinischen Franziens unter den Merovingischen und Karolingischen Königen bis in das Jahr 843. als eine Grundlage zur Pfälzischen Staats-Geschichte. Herausgegeben von Andreas Lamey. Mit einer Kopfvignette und einer grenzkolorierten Faltkarte. [Angebunden, ders. ]: Die Freundschaft der Pfälzer mit den Sachsen aus der Geschichte erwiesen. Eine Vorlesung welche bei Gelegenheit des Kurfürstlich Sächsischen und Pfalzgräflich Zweibrükischen Vermählungs-Fest in der Kurpfälzischen Akademie der Wissenschaften gehalten worden. Mit gestoch. Titel-, Kopf- und Schlußvignette sowie einer gefalteten Stammtafel. [2 Werke in einem Band]. - Original master print, titled: 'King Charles the First'. 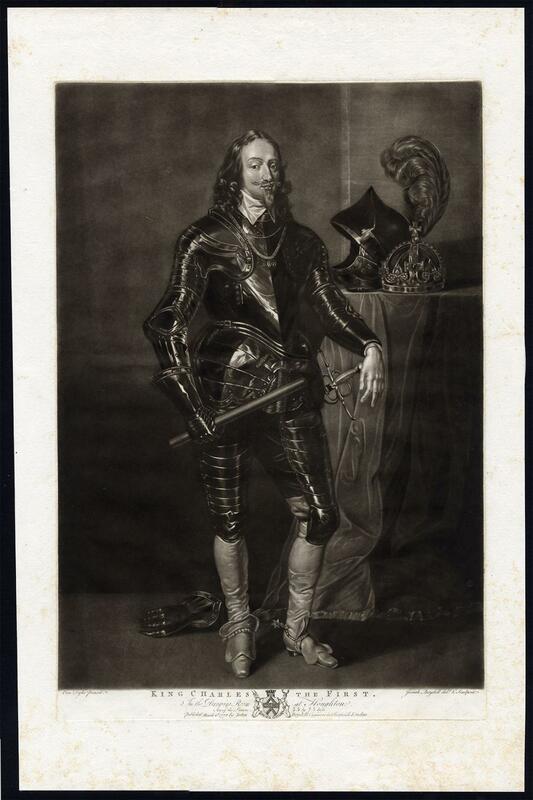 It shows a full-length portrait of King Charles the First, in armor. His helmet and crown are placed on a ledge next to him. Mezzotint engraving on a vellin type paper. Description: Original antique master print. Our definition of a Master Print is a seperately published print or series of prints, not being an illustrative print to a text. These can both be prints made by old masters (artists) or prints made by others (artists, engravers, etchers) after old masters.Artists and Engravers: Engraved by Boydell after a painting by Van Dyke. This print was published by John Boydell, in 1778. Sir Anthony van Dyck (1599-1641) was a Flemish artist. He became the leading court painter in England after enjoying great succes in Italy and Flanders. His elegant but casual portraits of court and nobility would set the style in English portrait painting for the next 150 years. Beside his portraits, Van Dyke is known for his mythological and biblical subject treatment. Josiah Boydell (1752-1817) was a British painter, engraver and publisher, who worked closely with his uncle, the publisher John Boydell. Josaih was trained in mezzotint engraving by Richard Earlom. One of his main commissions was to draw the picture collection of Richard Walpole. Condition: Very good, given age. Foxing, mainly in the right and bottom margins. General age-related toning and/or occasional light soiling from handling. Please study scan carefully. Storage location: DP-P1-19 The overall size is ca. 16.5 x 25.6 inch. The image size is ca. 13.8 x 20.9 inch. The overall size is ca. 42 x 65 cm. The image size is ca. 35 x 53 cm. Histoire naturelle, generale et particuliere. Nouvelle édition. 13 Bände + Supplement Bänd 1-10 in 10 Bände - zusammen 23 Bände. Dictionnaire de chimie contenant la théorie et la pratique de cette science, son application à la physique, à l'histoire naturelle, à la médecine et aux arts dépendans de la chimie. 2e édit. revue et considérablement augmentée. P., Th. 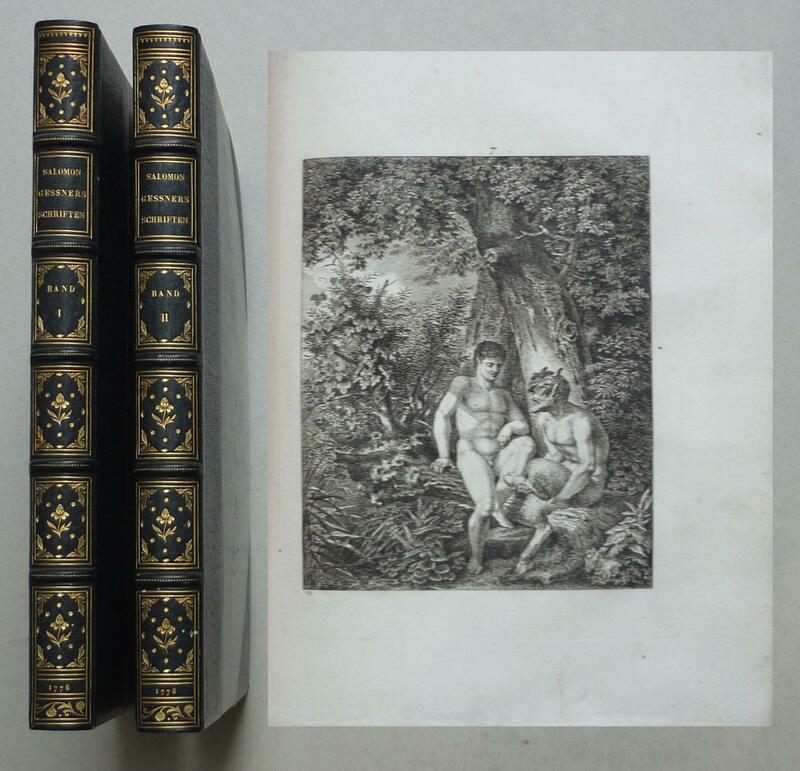 Barrois le jeune, 1778, 4 vol. in 12. demi-veau blond moucheté époque à petits coins, dos lisse à filets dorés, p. de t. vertes, qq. rousseurs bel exemplaire. La meilleure édition, la plus complète de l'?uvre la plus importante de Macquer. 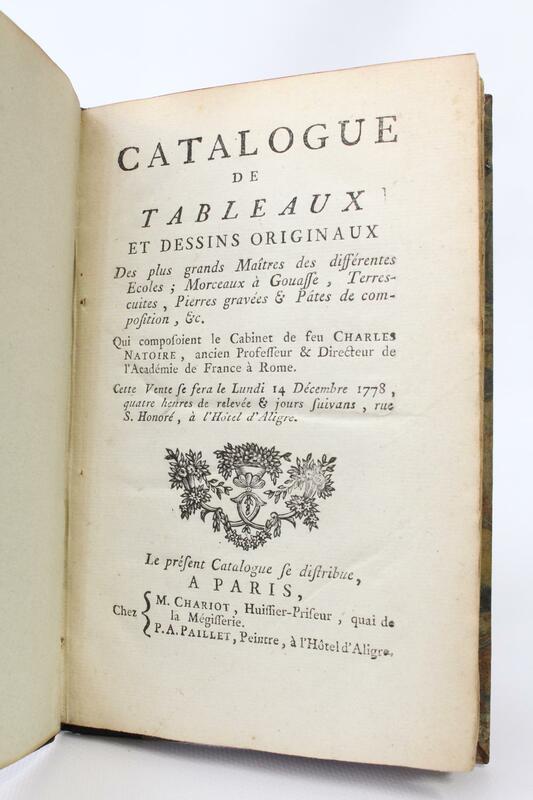 Ce tirage à la date de 1778 contient une importante table qui ne figure pas dans le tirage Didot de 1777. C'est le premier dictionnaire de chimie théorique et générale. Toutefois il contient aussi un grand nombre de préceptes de la philosophie hermétique, des secrets, et recettes de médecine spagyrique qui le font rechercher des amateurs. ¶ Duveen: "By far the most important of Macquer's works..." (p.377) - Poggendorff II.8/9 - Ferguson II,60 - D.S.B. VIII. 619 - Bolton I.68 - Caillet n°6934 qui ne cite que la 1ere édition en 2 volumes. - Map: 'Amerique ou Indes Occidentales .' (Map of America or the West Indies). Map of North and South America with inset maps of Martinique and Saint-Domingue / Santa Domingo. Including separate sheet with key. 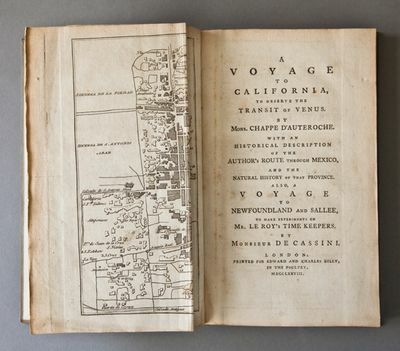 De Vaugondy's map of America, pre-dating information from any of the Cook Voyages. The NW Coast of America is shown wildly distorted to the west, with a number of mythical rivers flowing from the Pacific eastward, including the River of the West. The discoveries of Admiral De Font and Martin D'Aguilar are noted. Much of the Southwestern US is also shown as being traversed by branches of these long rivers, searching for a watercourse to the Mississippi. Large insets of Martinique and Haiti. A few minor in the lower margin, one just crossing neatline. Text panel on the right. Copperplate engraving and etching on a verge type hand laid paper. 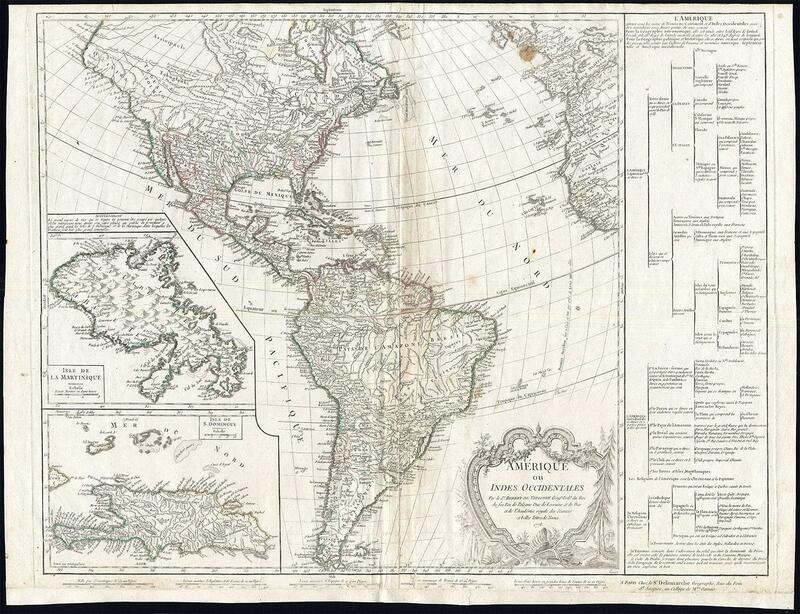 Description: This map originates from an unrecorded composite Atlas compiled around 1795 (based on youngest dated map) which contained many maps originally published in the famous 'Atlas Universel. ', by de Vaugondy, first published in 1757. To produce the atlas, the Vaugondys integrated older sources with more modern surveyed maps. They verified and corrected the latitude and longitude of many regional maps in the atlas with astronomical observations. The older material was revised with the addition of many new place names. 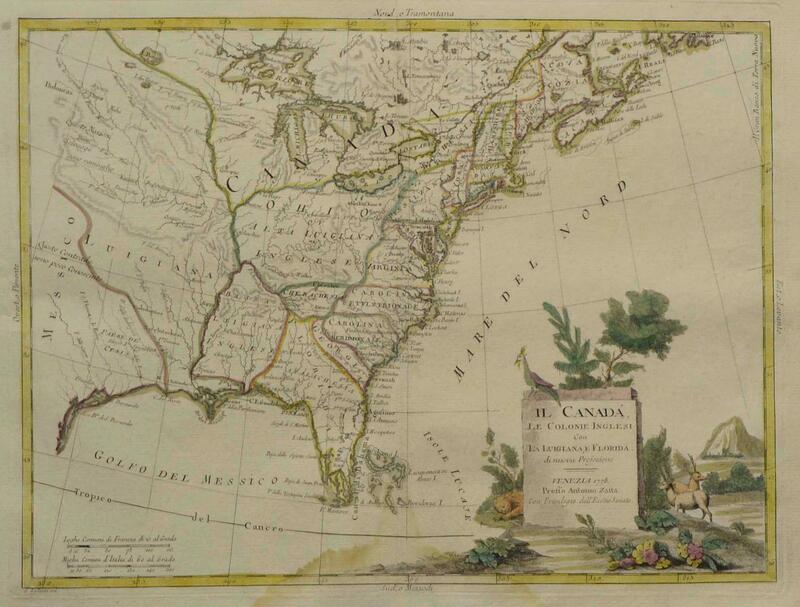 In the late 18th c. the plates of these maps were acquired by Delamarche. This map has reference to Le Sr. Robert de Vaugondy and Delamarche in it's cartouches. Date reference in cartouche: 1778.Artists and Engravers: Gilles Robert de Vaugondy (1688ï¿½1766), also known as Le Sieur or Monsieur Robert, and his son, Didier Robert de Vaugondy (c.1723ï¿½1786), were leading cartographers in France during the 18th century. Charles Francois Delamarche (1740-1817) founded the important and prolific Paris based Maison Delamarche map publishing firm in the late 18th century. A lawyer by trade Delamarche entered the map business with the acquisition from Jean-Baptiste Fortin of Robert de Vaugondy's map plates and copyrights and later addes many plates from other sources as well. Charles Delamarche eventually passed control of the firm to his son Felix Delamarche (18th C. - 1st half 19th C.) and geographer Charles Dien (1809-1870). It was later passed on to Alexandre Delamarche, who revised and reissued several Delamarche publications in the mid-19th century. The firm continued to publish maps and globes until the middle part of the 19th century. Condition: General age related toning and light staining. Worm holes at lower middle fold and bottom margin; paper separation lower middle fold, backed by identical paper. Irregular paper edges, chipped with small tears, backed by identical paper. Short margin at the bottom; remargined. Please study scan carefully. Storage location: (BG) B55-25 The overall size is ca. 27.8 x 20.9 inch. The image size is ca. 25.4 x 20.1 inch. The overall size is ca. 70.5 x 53 cm. The image size is ca. 64.5 x 51 cm. A List of Various Editions of the Bible, and Parts thereof, in English. From the Year 1526 to 1776. London: No imprint, 1778.. Tall 8vo. 73 pp. pp. Printed rectos only. 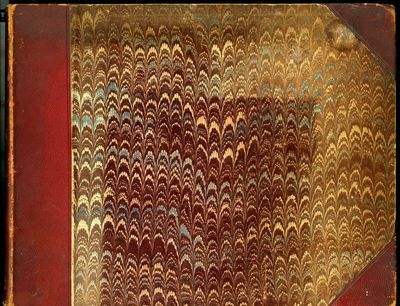 Original marbled wrappers. This is the second, greatly enlarged edition by Ducarel after the original 1777 list printed by William Bowyer and compiled by Joseph Ames. This book was Andrew Ducarel's personal copy and bears his signature dated 1778 on the top corner of the front cover verso. In addition it has his bookplate affixed to the verso's center. The book has at least 9 corrections to the text in Ducarel's hand, several of which are substantial. It is additionally INSCRIBED by Ducarel on the half-title page "Presented by Andrew Ducarel to W. Teggel(? )meyre | July 28th 1781." Ducarel (1713-1785) was a noted English librarian, lawyer, antiquary and archivist. He was keeper of the Lambeth Palace Library from 1757 until his death. Ducarel's numerous publications range from travel to history to law. The book's original marbled wrappers have some chipping at the extremities but the book remains in very good condition with most of the spine intact. There is a modern bookplate front cover verso at the bottom. A true rarity and obviously singular.. Signed by Author(s). Soft cover. Very Good. 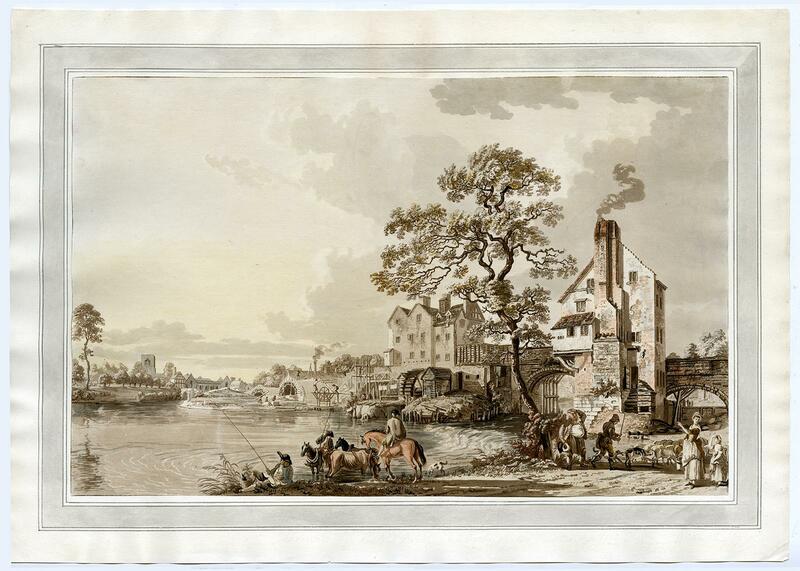 - Antique print, titled: 'Part of the old bridge at Shrewsbury with two arches of the new one.' - Attractive view of the old bridge at Shrewsbury with the new one being build in the distance. Line and aquatint etching on laid paper. Watermark: Large coat of arms with a French lily. Made by 'Paul Sandby' after own design. Paul Sandby (1731-1809) was an English map-maker turned landscape painter in watercolours, who, along with his older brother Thomas, became one of the founding members of the Royal Academy in 1768. He was a gifted artist, who was responsible for the intro Condition: Good, given age. Cut to the image, with loss of the textcaption, but with original attachment to carrier. General age-related toning and/or occasional minor defects from handling. Please study scan carefully. The overall size is ca. 20.1 x 12.8 inch. The image size is ca. 20.1 x 12.8 inch. The overall size is ca. 51 x 32.4 cm. The image size is ca. 51 x 32.4 cm. Miscellaneous Observations relating to Education. More especially, as it respects the conduct of the mind. To which is added, An essay on a course of liberal education for civil and active life. Bath, J. Johnson, 1778 [first edition]. Octavo, [iii]-xxvi, 334 pages (lacking the half-title and perhaps a terminal blank, with errata printed on page xxvi). 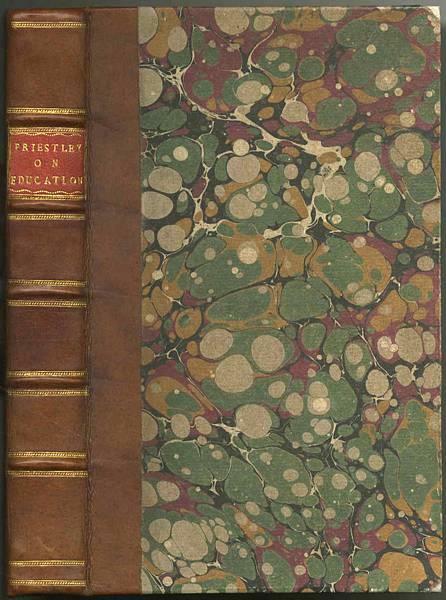 Early polished speckled calf with gilt-decorated edges and spine, raised bands and contrasting leather titling labels; leather a little rubbed, scuffed and lightly marked, with trifling loss to the head of the spine; hinges slightly cracked at the foot of the spine; scattered pale foxing (a little heavier on the endpapers and the first and last few leaves); front flyleaf a little creased; small light inoffensive tidemarks to the top (blank) margin of a few sections; essentially a very good copy with contemporary ownership details (dated 1780) on the front flyleaf. Versuch über einige merkwürdige Alterthümer im Königreich Böhmen.